LAS VEGAS, NV--(Marketwire - Oct 30, 2012) - Today, Hannibal Industries is showing its custom O.E.M. truck stacks and motorcycle exhaust tube at the 2012 SEMA Show for the first time. Located at Booth #10185, Hannibal Industries will premiere its ability to customize exhaust tubing that is flash controlled, cut-to-length with chamfered ends and a bright finish for the automotive industry. Ranging in size from 3.25 to 5 inches, the floor samples shown are both raw and fabricated material which is cut, chamfered, deburred, cold rolled and plated. These floor samples are examples of Hannibal Industries' capabilities and custom orders for its current O.E.M. clients. "Making our SEMA debut, Hannibal Industries' custom exhaust tubes will show the automotive industry how our manufacturing can be tailored for numerous O.E.M. accounts," said Steve Rogers, vice president of Hannibal Industries, Inc. "Hannibal Industries has a 27 year track record of producing custom O.E.M. automotive tube for some of the industry's leaders." Held at the Las Vegas Convention Center from Tuesday, October 30 until Friday, November 2, the SEMA Show premiers specialty products catered to the automotive market. Connect with Hannibal Industries on Twitter @HannibalTube and on LinkedIn. 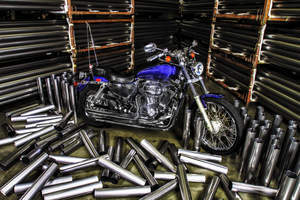 For additional information on Hannibal Industries' complete automotive exhaust offerings visit www.hannibalindustries.com. Hannibal Industries, Inc., headquartered in the Los Angeles metro area, is a carbon steel tube and storage system manufacturer with a diverse product line. This employee-owned company is registered to the requirements of ISO 9001:2008 and provides custom tubular products to the following automotive O.E.M. accounts: Tenneco, Cycle Shack, Dynaflex Products, Engine Control Systems, Freedom Performance, Markland Industries and Pacesetter Performance Products. For additional information, visit www.hannibalindustries.com. About this company Hannibal Industries, Inc.
Today, Hannibal Industries is showing its custom O.E.M. truck stacks and motorcycle exhaust tube at the 2012 SEMA Show for the first time. Located at Booth #10185, Hannibal Industries will premiere its ability to customize exhaust tubing that is flash controlled, cut-to-length with chamfered ends and a bright finish for the automotive industry.